Well here we are; it’s the Friday. 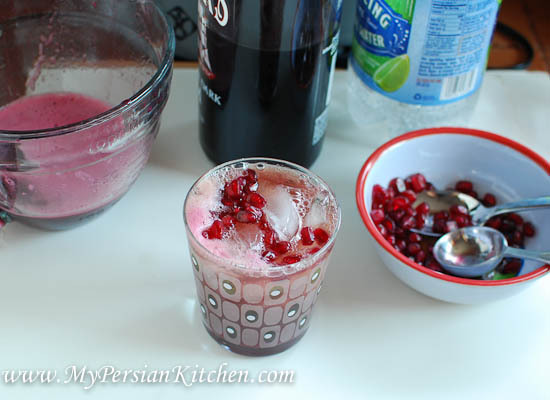 Today I bring you the final recipe for this year’s Pomegranate Week 2013. 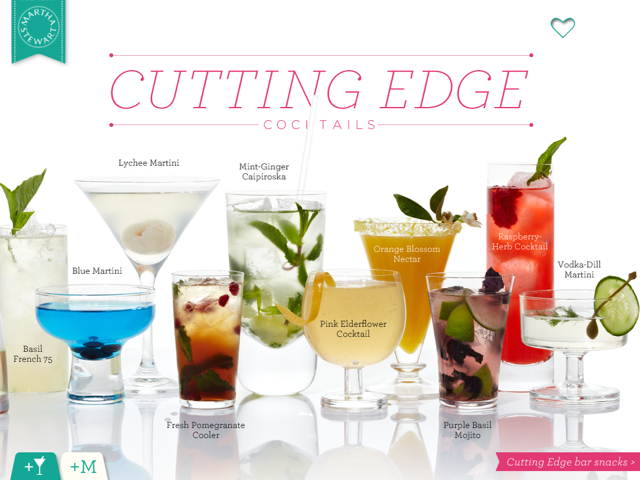 We are going to wrap things up this year with a fabulous cocktail. It is only opportune to publish said recipe on a Friday because it can easily be made tonight for Happy Hour! Tomorrow is Saturday, so indulge my friends in some Pom & Rum action! 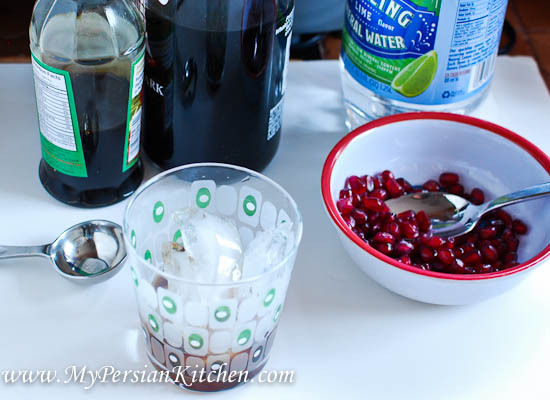 I had never really thought about combining Pomegranate juice, or syrup, with rum. I have to say, not bad! Not bad, at all!! The inspiration for this drink came from a Martha Stewart Cocktails app that I downloaded last year. I don’t need to tell you that I was immediately drawn to the one with pomegranates in it, do I?! Well just in case you were wondering I totally was! Let me begin by saying that I have an affinity for bartenders who can come up with creative drinks. I love reading Cocktail menus, specifically going beyond the popular cocktails. I love to see what the house bartenders offer. I am not particularly well versed when it comes to combining different types of alcohol, liqueurs, and juices. But I do know this, creating cocktails is no different than cooking; one just needs to be familiar with the flavors and then decide on the right amounts to pour. I first made the cocktail from the app last week. I can’t say it was love at first sight. My issue with it was that the honey that the recipe asked for to be mulled with the mint and pomegranate syrup turned into a sticky lump at the bottom of the glass. Once the ingredients were combined the Sous Chef and I came to the conclusion that there was way too much competition between the flavors. 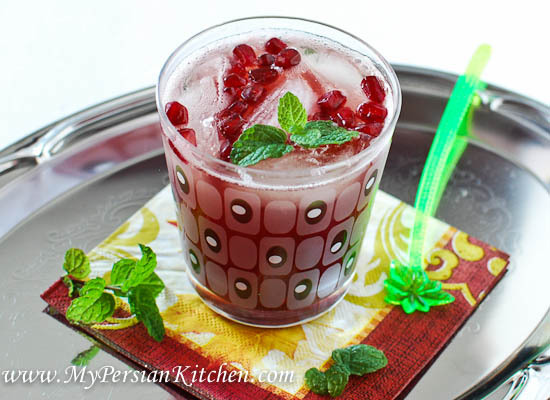 And then by the time the drink was consumed the pomegranate arils had joined the sticky lump at the bottom. Hmmm….it had potential…I thought to myself. A few combinations later I present to you Pom & Rum! Pour rum and pomegranate syrup in a glass. Mix well, then add ice. Add pomegranate juice on top along with sparkling water. 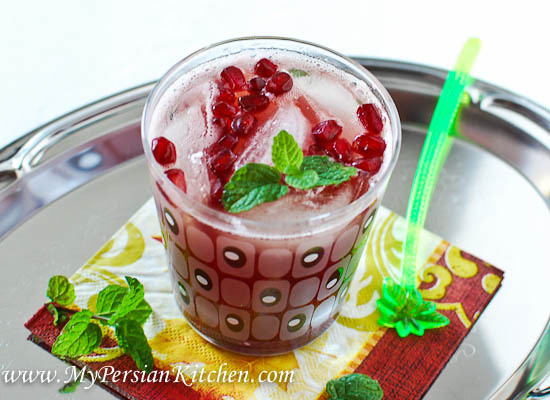 Give it a good stir, then add pomegranates on top. Add mint for decoration and serve on a cocktail napkin!! Happy Friday! Note: you can use lime flavored sparkling water or regular sparkling water with a dash of lime. Note #2: If you can’t have alcohol, like my friend Golareh who is on the last few weeks of her pregnancy, then you can still have this drink by simply omitting the rum! It’s still delicious!